Director of the Master's Degree Program "Clinical Pharmacology and Therapeutics"
Visiting Professor, Department of Pharmacy and Pharmacology, University of Bath, United Kingdom. 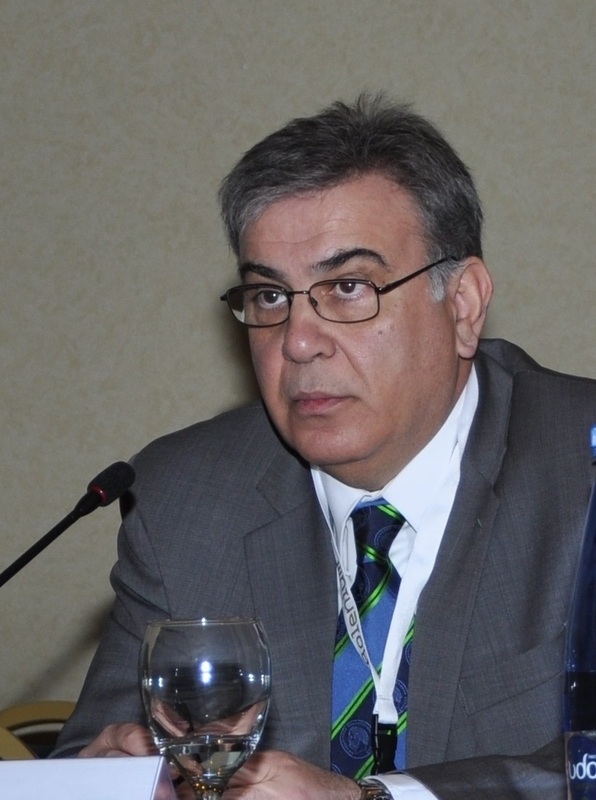 Member of the Scientific Board for Drug Approval, Greek National Organization for Medicines (September 2008 - November 2013). Vice President of the Helllenic Society of Gastroenterology. Vice President of the Helllenic Scientific Society for Rare Diseases & Orphan Drugs. Member of the Greek Society of Pharmacology. Member of the Society for Mucosal Immunology. Member of the European Crohn's and Colitis Organisation. Panagopoulou M, Karaglani M, Balgkouranidou I, Biziota E, Koukaki T, Karamitrousis E, Nena E, Tsamardinos I, Kolios G, Lianidou E, Kakolyris S, Chatzaki E. Circulating cell-free DNA in breast cancer: size profiling, levels, and methylation patterns lead to prognostic and predictive classifiers. Oncogene . 2019; doi: 10.1038/s41388-018-0660-y. Dovrolis N, Drygiannakis I, Filidou E, Kandilogiannakis L, Arvanitidis K, Tentes I, Kolios G, Valatas V. Gut Microbial Signatures Underline Complicated Crohn's Disease but Vary Between Cohorts; An in Silico Approach. Inflammatory Bowel Diseases . 2019; 25:217-225. Panagopoulou M, Karaglani M, Balgkouranidou I, Pantazi C, Kolios G, Kakolyris S, Chatzaki E. Circulating cell-free DNA release in vitro: kinetics, size profiling, and cancer-related gene methylation. Journal of Cellular Physiology . 2019; doi: 10.1002/jcp.28097. Tsaousi G, Stavrou G, Fotiadis K, Kotzampassi K, Kolios G. Implementation of phospholipids as pharmacological modalities for postoperative adhesions prevention. European Journal of Pharmacology . 2019; 842:189-196. Karatzas E, Kolios G, Spyrou GM. An Application of Computational Drug Repurposing Based on Transcriptomic Signatures. Methods in Molecular Biology . 2019; 1903:149-177. Tsekoura M, Ioannidou M, Pana ZD, Haidich AB, Antachopoulos C, Iosifidis E, Kolios G, Roilides E. Efficacy and Safety of Echinocandins for the Treatment of Invasive Candidiasis in Children: A Meta-analysis. Pediatric Infectious Disease Journal . 2019; 38:42-49. Sertaridou EN, Chouvarda IG, Arvanitidis KI, Filidou EK, Kolios GC, Pnevmatikos IN, Papaioannou VE. Melatonin and cortisol exhibit different circadian rhythm profiles during septic shock depending on timing of onset: a prospective observational study. Annals of Intensive Care . 2018; 8:118. Fasoulakis Z, Kolios G, Papamanolis V, Kontomanolis EN. Interleukins Associated with Breast Cancer. Cureus . 2018; 10:e3549. Ioannidis A, Arvanitidis K, Filidou E, Valatas V, Stavrou G, Michalopoulos A, Kolios G, Kotzampassi K. The Length of Surgical Skin Incision in Postoperative Inflammatory Reaction. Journal of the Society of Laparoendoscopic Surgeons . 2018; 22. pii: e2018.00045. Filidou E, Valatas V, Drygiannakis I, Arvanitidis K, Vradelis S, Kouklakis G, Kolios G, Bamias G. Cytokine Receptor Profiling in Human Colonic Subepithelial Myofibroblasts: A Differential Effect of Th Polarization-Associated Cytokines in Intestinal Fibrosis. Inflammatory Bowel Diseases . 2018; 24:2224-2241. Stavrou G, Arvanitidis K, Filidou E, Fotiadis K, Grosomanidis V, Ioannidis A, Tsaousi G, Michalopoulos A, Kolios G, Kotzampassi K. Combined Enteral and Parenteral Glutamine Supplementation in Endotoxaemic Swine: Effects on Portal and Systemic Circulation Levels. Medical Principles and Practice . 2018; doi: 10.1159/000493481. Papavramidis TS, Stavrou G, Papakostas P, Grosomanidis V, Kokkota S, Michalopoulos A, Kolios G, Kotzampassi K. Displacement of the Intragastric Balloon from the Fundus to the Antrum Results in Enhanced Weight Loss. Obesity Surgery . 2018; 28:2374-2378. Brinkman DJ, Tichelaar J, Mokkink LB, Christiaens T, Likic R, Maciulaitis R, Costa J, Sanz EJ, Maxwell SR, Richir MC, van Agtmael MA. Key Learning Outcomes for Clinical Pharmacology and Therapeutics Education in Europe: A Modified Delphi Study. Clinical Pharmacology and Therapeutics . 2018; 104:317-325. Gogou M, Kolios G. Are therapeutic diets an emerging additional choice in autism spectrum disorder management? World Journal of Pediatrics . 2018; 14:215-223. Karaglani M, Ragia G, Panagopoulou M, Balgkouranidou I, Nena E, Kolios G, Papanas N, Manolopoulos VG, Chatzaki E. Search for Pharmacoepigenetic Correlations in Type 2 Diabetes Under Sulfonylurea Treatment. Experimental and Clinical Endocrinology & Diabetes . 2018; doi: 10.1055/s-0043-121265. Dovrolis N, Kolios G, Spyrou GM, Maroulakou I. Computational profiling of the gut-brain axis: microflora dysbiosis insights to neurological disorders. Briefings in Bioinformatics . 2017; doi: 10.1093/bib/bbx154. Karatzas E, Bourdakou MM, Kolios G, Spyrou GM. Drug repurposing in idiopathic pulmonary fibrosis filtered by a bioinformatics-derived composite score. Scientific Reports . 2017; 7:12569. Bouros E, Filidou E, Arvanitidis K, Mikroulis D, Steiropoulos P, Bamias G, Bouros D, Kolios G. Lung fibrosis-associated soluble mediators and bronchoalveolar lavage from idiopathic pulmonary fibrosis patients promote the expression of fibrogenic factors in subepithelial lung myofibroblasts. Pulmonary Pharmacology & Therapeutics 2017; 46:78-87. Gogou M, Kolios G. The effect of dietary supplements on clinical aspects of autism spectrum disorder: A systematic review of the literature. Brain & Development . 2017; 39:656-664. Dovrolis N, Kolios G, Spyrou G, Maroulakou I. Laying in silico pipelines for drug repositioning: a paradigm in ensemble analysis for neurodegenerative diseases. Drug Discovery Today . 2017; 22:805-813. Valatas V, Filidou E, Drygiannakis I, Kolios G. Stromal and immune cells in gut fibrosis: the myofibroblast and the scarface. Annals of Gastroenterology . 2017; 30:393-404. Panagopoulou M, Lambropoulou M, Balgkouranidou I, Nena E, Karaglani M, Nicolaidou C, Asimaki A, Konstantinidis T, Constantinidis TC, Kolios G, Kakolyris S, Agorastos T, Chatzaki E. Gene promoter methylation and protein expression of BRMS1 in uterine cervix in relation to high-risk human papilloma virus infection and cancer. Tumour Biology . 2017; 39:1010428317697557. Bamias G, Filidou E, Goukos D, Valatas V, Arvanitidis K, Panagopoulou M, Kouklakis G, Daikos GL, Ladas SD, Kolios G. Crohn's disease-associated mucosal factors regulate the expression of TNF-like cytokine 1A and its receptors in primary subepithelial intestinal myofibroblasts and intestinal epithelial cells. Translational Research . 2017; 180:118-130.e2. Kotanidis L, Nikolettos K, Petousis S, Asimakopoulos B, Chatzimitrou E, Kolios G, Nikolettos N. The use of serum anti-Mullerian hormone (AMH) levels and antral follicle count (AFC) to predict the number of oocytes collected and availability of embryos for cryopreservation in IVF. Journal of Endocrinological Investigation . 2016; 39:1459-1464. Kolios G Animal models of inflammatory bowel disease: how useful are they really? Current Opinion in Gastroenterology . 2016; 32:251-257. Kolios G . Bin1 Antibodies for IBD Therapy: Is Permeability the Answer BAR None? Digestive Diseases and Sciences . 2016; 61:330-331. Fotiadis K, Filidou E, Arvanitidis K, Valatas V, Stavrou G, Basdanis G, Paspaliaris V, Kolios G, Kotzampassi K. Intraperitoneal application of phospholipids for the prevention of postoperative adhesions: a possible role of myofibroblasts. Journal of Surgical Research . 2015; 197(2):291-300. Valatas V, Bamias G, Kolios G. Experimental colitis models: Insights into the pathogenesis of inflammatory bowel disease and translational issues. European Journal of Pharmacology . 2015; 759:253-264. Sertaridou E, Papaioannou V, Kolios G, Pneumatikos I. Gut failure in critical care: old school versus new school. Annals of Gastroenterology . 2015; 28:309-322. Drosos I, Tavridou A, Kolios G. New aspects on the metabolic role of intestinal microbiota in the development of atherosclerosis. Metabolism: Clinical and Experimental . 2015; 64:476-481. Fouka E, Lamprianidou E, Arvanitidis K, Filidou E, Kolios G, Miltiades P, Paraskakis E, Antoniadis A, Kotsianidis I, Bouros D. Low-dose clarithromycin therapy modulates Th17 response in non-cystic fibrosis bronchiectasis patients. Lung . 2014; 192(6):849-855. Lalidou F, Kolios G, Tavridou A, Drosos GI. Bone grafts as carriers for local antibiotic delivery for the treatment and prevention of bone infections. Surgical Technology International . 2014; 25:239-245. Karampelas T, Argyros O, Sayyad N, Spyridaki K, Pappas C, Morgan K, Kolios G, Millar RP, Liapakis G, Tzakos AG, Fokas D, Tamvakopoulos C. GnRH-Gemcitabine conjugates for the treatment of androgen-independent prostate cancer: pharmacokinetic enhancements combined with targeted drug delivery. Bioconjugate Chemistry . 2014; 25:813-823. Lalidou F, Kolios G, Drosos GI. Bone infections and bone graft substitutes for local antibiotic therapy. Surgical Technology International . 2014; 24:353-362. Valatas V, Vakas M, Kolios G. The value of experimental models of colitis in predicting efficacy of biological therapies for inflammatory bowel diseases. American Journal of Physiology. Gastrointestinal and Liver Physiology . 2013; 305:G763- G785. Drosos I, Kolios G. Stem cells in liver regeneration and their potential clinical applications. Stem Cell Reviews . 2013; 9:668-684. Tzouvelekis A, Paspaliaris V, Koliakos G, Ntolios P, Bouros E, Oikonomou A, Zissimopoulos A, Boussios N, Dardzinski B, Gritzalis D, Antoniadis A, Froudarakis M, Kolios G, Bouros D. A prospective, non-randomized, no placebo-controlled, phase Ib clinical trial to study the safety of the adipose derived stromal cells-stromal vascular fraction in idiopathic pulmonary fibrosis. Journal of Translational Medicine . 2013; 11:171. Balgkouranidou I, Karayiannakis A, Matthaios D, Bolanaki H, Tripsianis G, Tentes AA, Lianidou E, Chatzaki E, Fiska A, Lambropoulou M, Kolios G, Kakolyris S. Assessment of SOX17 DNA methylation in cell free DNA from patients with operable gastric cancer. Association with prognostic variables and survival. Clinical Chemistry and Laboratory Medicine . 2013; 51:1505-1510. Valatas V, He J, Rivollier A, Kolios G, Kitamura K, Kelsall BL. Host-dependent control of early regulatory and effector T-cell differentiation underlies the genetic susceptibility of RAG2-deficient mouse strains to transfer colitis. Mucosal Immunology . 2013; 6:601-611. Drygiannakis I, Valatas V, Sfakianaki O, Bourikas L, Manousou P, Kambas K, Ritis K, Kolios G, Kouroumalis E. Proinflammatory cytokines induce crosstalk between colonic epithelial cells and subepithelial myofibroblasts: implication in intestinal fibrosis. Journal of Crohn's & Colitis . 2013; 7:286-300. Paschos KA, Chouridou E, Koureta M, Lambropoulou M, Kolios G, Chatzaki E. The corticotropin releasing factor system in the liver: expression, actions and possible implications in hepatic physiology and pathology. Hormones . 2013; 12:236-245. Pazaitou-Panayiotou K, Chemonidou C, Poupi A, Koureta M, Kaprara A, Lambropoulou M, Constantinidis TC, Galaktidou G, Koffa M, Kiziridou A, Kakolyris S, Kolios G, Kortsaris A, Chatzaki E. Gonadotropin-releasing hormone neuropeptides and receptor in human breast cancer: correlation to poor prognosis parameters. Peptides . 2013; 42:15-24. Manousou P, Kolios G, Drygiannakis I, Koulentaki M, Pyrovolaki K, Voumvouraki A, Notas G, Bourikas L, Papadaki HA, Kouroumalis E. CXCR3 axis in patients with primary biliary cirrhosis: a possible novel mechanism of the effect of ursodeoxycholic acid. Clinical and Experimental Immunology . 2013; 172:9-15. Chatzaki E, Anton PA, Million M, Lambropoulou M, Constantinidis T, Kolios G, Taché Y, Grigoriadis DE. Corticotropin-releasing factor receptor subtype 2 in human colonic mucosa: down-regulation in ulcerative colitis. World Journal of Gastroenterology . 2013; 19:1416-1423. Kolios G , Moodley Y. Introduction to stem cells and regenerative medicine. Respiration . 2013; 85:3-10. Domvri K, Zarogoulidis P, Porpodis K, Koffa M, Lambropoulou M, Kakolyris S, Kolios G, Zarogoulidis K, Chatzaki E. Gene therapy in liver diseases: state-of-the-art and future perspectives. Current Gene Therapy . 2012; 12(6):463-483. Tzouvelekis A, Galanopoulos N, Bouros E, Kolios G, Zacharis G, Ntolios P, Koulelidis A, Oikonomou A, Bouros D. Effect and safety of mycophenolate mofetil or sodium in systemic sclerosis-associated interstitial lung disease: a meta-analysis. Pulmonary Medicine . 2012; 2012:143637. Tzouvelekis A, Bouros E, Oikonomou A, Ntolios P, Zacharis G, Kolios G, Bouros D. Effect and safety of mycophenolate mofetil in idiopathic pulmonary fibrosis. Pulmonary Medicine . 2011; 2011:849035. Chrysanthopoulou A, Mitroulis I, Kambas K, Skendros P, Kourtzelis I, Vradelis S, Kolios G, Aslanidis S, Doumas M, Ritis K. Tissue factor-thrombin signaling enhances the fibrotic activity of myofibroblasts in systemic sclerosis through up-regulation of endothelin receptor A. Arthritis and Rheumatism . 2011; 63:3586-97. Tzouvelekis A, Koliakos G, Ntolios P, Baira I, Bouros E, Oikonomou A, Zissimopoulos A, Kolios G, Kakagia D, Paspaliaris V, Kotsianidis I, Froudarakis M, Bouros D. Stem cell therapy for idiopathic pulmonary fibrosis: a protocol proposal. Journal of Translational Medicine . 2011; 9:182. Kambas K, Chrysanthopoulou A, Kourtzelis I, Skordala M, Mitroulis I, Rafail S, Vradelis S, Sigalas I, Wu YQ, Speletas M, Kolios G, Ritis K. Endothelin-1 signaling promotes fibrosis in vitro in a bronchopulmonary dysplasia model by activating the extrinsic coagulation cascade. Journal of Immunology . 2011; 186:6568-6575. Tsagarakis NJ, Drygiannakis I, Batistakis AG, Kolios G, Kouroumalis EA. Octreotide induces caspase activation and apoptosis in human hepatoma HepG2 cells. World Journal of Gastroenterology . 2011; 17:313-321. Manousou P, Kolios G, Valatas V, Drygiannakis I, Bourikas L, Pyrovolaki K, Koutroubakis I, Papadaki HA, Kouroumalis E. Increased expression of chemokine receptor CCR3 and its ligands in ulcerative colitis: the role of colonic epithelial cells in in vitro studies. Clinical and Experimental Immunology . 2010; 162:337-347. Tsagarakis NJ, Drygiannakis I, Batistakis AG, Kolios G, Kouroumalis EA. A concentration-dependent effect of ursodeoxycholate on apoptosis and caspases activities of HepG2 hepatocellular carcinoma cells. European Journal of Pharmacology . 2010; 640:1-7. Kapetanakis S, Drygiannakis I, Kazakos K, Papanas N, Kolios G, Kouroumalis E, Verettas DA. Serum TGF-beta2 and TGF-beta3 are increased and positively correlated to pain, functionality, and radiographic staging in osteoarthritis. Orthopedics . 2010; 33:8. Kefalakes H, Stylianides TJ, Amanakis G, Kolios G. Exacerbation of inflammatory bowel diseases associated with the use of nonsteroidal anti-inflammatory drugs: myth or reality? European Journal of Clinical Pharmacology . 2009; 65:963-970. Paschos KA, Kolios G, Chatzaki E. The corticotropin-releasing factor system in inflammatory bowel disease: prospects for new therapeutic approaches. Drug Discovery Today . 2009; 14:713-20. Bourikas LA, Kolios G, Valatas V, Notas G, Drygiannakis I, Pelagiadis I, Manousou P, Klironomos S, Mouzas IA, Kouroumalis E. Ciprofloxacin decreases survival in HT-29 cells via the induction of TGF-beta1 secretion and enhances the anti-proliferative effect of 5-fluorouracil. British Journal of Pharmacology . 2009; 157:362-370. Kotzampassi K, Kolios G, Manousou P, Kazamias P, Paramythiotis D, Papavramidis TS, Heliadis S, Kouroumalis E, Eleftheriadis E. Oxidative stress due to anesthesia and surgical trauma: importance of early enteral nutrition. Molecular Nutrition & Food Research . 2009; 53:770-779. Galazios G, Papazoglou D, Tsikouras P, Kolios G. Vascular endothelial growth factor gene polymorphisms and pregnancy. The Journal of Maternal-Fetal & Neonatal Medicine . 2009; 22:371-378. Manousou P, Kolios G, Drygiannakis I, Pyrovolaki K, Bourikas L, Papadaki HA, Kouroumalis E. Expression of a splice variant of CXCR3 in Crohn's disease patients; indication for a lymphocyte--epithelial cell interaction. Journal of Gastroenterology and Hepatology . 2008; 23:1823-33. Kolios G , Valatas V, Manousou P, Xidakis C, Notas G, Kouroumalis E. Nitric oxide and MCP-1 regulation in LPS activated rat Kupffer cells. Molecular and Cellular Biochemistry . 2008; 319:91-98. Damaskos D, Kolios G. Probiotics and prebiotics in inflammatory bowel disease: microflora 'on the scope'. British Journal of Clinical Pharmacology . 2008; 65:453-467. Xidakis C, Mastrodimou N, Notas G, Renieri E, Kolios G, Kouroumalis E, Thermos K. RT-PCR and immunocytochemistry studies support the presence of somatostatin, cortistatin and somatostatin receptor subtypes in rat Kupffer cells. Regulatory Peptides . 2007; 143:76-82. Kolios G , Kotzampassi K, Manousou P, Paramythiotis D, Papanastasiou H, Drygiannakis I, Notas G, Tsagarakis N, Eleftheriadis E, Kouroumalis E. Enteral nutrition affects nitric oxide production in peripheral blood and liver after a postoperative lipopolysaccharide-induced endotoxemia in rats. Nutrition . 2007; 23:575-581. Kolios G , Valatas V, Kouroumalis E. Role of Kupffer cells in the pathogenesis of liver disease. World Journal of Gastroenterology . 2006; 12:7413-7420. Charalampopoulos I, Androulidaki A, Minas V, Chatzaki E, Tsatsanis C, Notas G, Xidakis C, Kolios G, Kouroumalis E, Margioris AN, Gravanis A. Neuropeptide urocortin and its receptors are expressed in rat Kupffer cells. Neuroendocrinology . 2006; 84:49-57. Kolios G , Manousou P, Bourikas L, Notas G, Tsagarakis N, Mouzas I, Kouroumalis E. Ciprofloxacin inhibits cytokine-induced nitric oxide production in human colonic epithelium. European Journal of Clinical Investigation . 2006; 36:720-729. Linehan JD, Kolios G, Valatas V, Robertson DA, Westwick J. Immunomodulatory cytokines suppress epithelial nitric oxide production in inflammatory bowel disease by acting on mononuclear cells. Free Radical Biology & Medicine . 2005; 39:1560-1569. Kouroumalis A, Nibbs RJ, Aptel H, Wright KL, Kolios G, Ward SG. The chemokines CXCL9, CXCL10, and CXCL11 differentially stimulate G alpha i-independent signaling and actin responses in human intestinal myofibroblasts. Journal of Immunology . 2005; 175:5403-5411. Xidakis C, Ljumovic D, Manousou P, Notas G, Valatas V, Kolios G, Kouroumalis E. Production of pro- and anti-fibrotic agents by rat Kupffer cells; the effect of octreotide. Digestive Diseases and Sciences . 2005; 50:935-941. Dimoulios P, Kolios G, Notas G, Matrella E, Xidakis C, Koulentaki M, Tsagarakis N, Kouroumalis A, Kouroumalis E. Ursodeoxycholic acid reduces increased circulating endothelin 2 in primary biliary cirrhosis. Alimentary Pharmacology & Therapeutics . 2005; 21:227-234. Linehan JD, Kolios G, Valatas V, Robertson DA, Westwick J. Effect of corticosteroids on nitric oxide production in inflammatory bowel disease: are leukocytes the site of action? American Journal of Physiology. Gastrointestinal and Liver Physiology . 2005; 288:G261-G267. Kolios G , Valatas V, Ward SG. Nitric oxide in inflammatory bowel disease: a universal messenger in an unsolved puzzle. Immunology . 2004; 113:427-437. Koutroubakis IE, Theodoropoulou A, Xidakis C, Sfiridaki A, Notas G, Kolios G, Kouroumalis EA. Association between enhanced soluble CD40 ligand and prothrombotic state in inflammatory bowel disease. European Journal of Gastroenterology & Hepatology . 2004; 16:1147-1152. Valatas V, Kolios G, Manousou P, Xidakis C, Notas G, Ljumovic D, Kouroumalis EA. Secretion of inflammatory mediators by isolated rat Kupffer cells: the effect of octreotide. Regulatory Peptides . 2004; 120:215-225. Vasilaki A, Papadaki T, Notas G, Kolios G, Mastrodimou N, Hoyer D, Tsilimbaris M, Kouroumalis E, Pallikaris I, Thermos K. Effect of somatostatin on nitric oxide production in human retinal pigment epithelium cell cultures. Investigative Ophthalmology & Visual Science . 2004; 45:1499-1506. Notas G, Kolios G, Mastrodimou N, Kampa M, Vasilaki A, Xidakis C, Castanas E, Thermos K, Kouroumalis E. Cortistatin production by HepG2 human hepatocellular carcinoma cell line and distribution of somatostatin receptors. Journal of Hepatology . 2004; 40:792-798. Wright KL, Weaver SA, Patel K, Coopman K, Feeney M, Kolios G, Robertson DA, Ward SG. Differential regulation of prostaglandin E biosynthesis by interferon-gamma in colonic epithelial cells. British Journal of Pharmacology . 2004; 141:1091-1097. Xidakis C, Kolios G, Valatas V, Notas G, Mouzas I, Kouroumalis E. Effect of octreotide on apoptosis-related proteins in rat Kupffer cells: a possible anti-tumour mechanism. Anticancer Research . 2004; 24:833-841. Valatas V, Kolios G, Manousou P, Notas G, Xidakis C, Diamantis I, Kouroumalis E. Octreotide regulates CC but not CXC LPS-induced chemokine secretion in rat Kupffer cells. British Journal of Pharmacology . 2004; 141:477-487. Valatas V, Xidakis C, Roumpaki H, Kolios G, Kouroumalis EA. Isolation of rat Kupffer cells: a combined methodology for highly purified primary cultures. Cell Biology International . 2003; 27:67-73. Kolios G , Valatas V, Psilopoulos D, Petraki K, Kouroumalis E. Depletion of non-specific esterase activity in the colonic mucosa of patients with ulcerative colitis. European Journal of Clinical Investigation . 2002; 32:265-273. Weaver SA, Russo MP, Wright KL, Kolios G, Jobin C, Robertson DA, Ward SG. Regulatory role of phosphatidylinositol 3-kinase on TNF-alpha-induced cyclooxygenase 2 expression in colonic epithelial cells. Gastroenterology . 2001; 120:1117-1127. Kolios G , Wright KL, Linehan JD, Robertson DA, Westwick J. Interleukin-13 inhibits nitric oxide production in human colonic mucosa. Hepato-Gastroenterology . 2000; 47:714-717. Jordan NJ, Kolios G, Abbot SE, Sinai MA, Thompson DA, Petraki K, Westwick J. Expression of functional CXCR4 chemokine receptors on human colonic epithelial cells. Journal of Clinical Investigation . 1999; 104:1061-1069. Wright K, Kolios G, Westwick J, Ward SG. Cytokine-induced apoptosis in epithelial HT-29 cells is independent of nitric oxide formation. Evidence for an interleukin-13-driven phosphatidylinositol 3-kinase-dependent survival mechanism. Journal of Biological Chemistry . 1999; 274:17193-17201. Kolios G , Wright KL, Jordan NJ, Leithead JB, Robertson DA, Westwick J. C-X-C and C-C chemokine expression and secretion by the human colonic epithelial cell line, HT-29: differential effect of T lymphocyte-derived cytokines. European Journal of Immunology . 1999; 29:530-536. Kolios G , Petoumenos C, Nakos A. Mediators of inflammation: production and implication in inflammatory bowel disease. Hepato-Gastroenterology . 1998; 45:1601-1609. Kolios G , Rooney N, Murphy CT, Robertson DA, Westwick J. Expression of inducible nitric oxide synthase activity in human colon epithelial cells: modulation by T lymphocyte derived cytokines. Gut . 1998; 43:56-63. Davis AJ, Kolios G, Alveyn CG, Robertson DA. Antibiotic prophylaxis for ERCP: a comparison of oral ciprofloxacin with intravenous cephazolin in the prophylaxis of high-risk patients. Alimentary Pharmacology & Therapeutics . 1998; 12:207-11. Wright K, Ward SG, Kolios G, Westwick J. Activation of phosphatidylinositol 3-kinase by interleukin-13. An inhibitory signal for inducible nitric-oxide synthase expression in epithelial cell line HT-29. Journal of Biological Chemistry . 1997; 272:12626-12633. Kolios G , Robertson DA, Jordan NJ, Minty A, Caput D, Ferrara P, Westwick J. Interleukin-8 production by the human colon epithelial cell line HT-29: modulation by interleukin-13. British Journal of Pharmacology . 1996; 119:351-359. Kolios G , Brown Z, Robson RL, Robertson DA, Westwick J. Inducible nitric oxide synthase activity and expression in a human colonic epithelial cell line, HT-29. British Journal of Pharmacology . 1995; 116:2866-2872. Kolios G , Kaloterakis A, Filiotou A, Nakos A, Hadziyannis S. Gastroscopic findings in Mediterranean Kaposi's sarcoma (non-AIDS). Gastrointestinal Endoscopy . 1995; 42:336-339.